TOKYO - Tokyo's popular governor Yuriko Koike launched a bitter attack on Prime Minister Shinzo Abe Tuesday as the gloves came off for the official start of a snap election campaign in the world's third-largest economy. Conservative premier Abe, 63, is facing an unexpected and fierce challenge from the media-savvy Koike, who has upended the sleepy world of Japanese politics with her upstart "Party of Hope." Addressing hundreds of commuters at a busy Tokyo station via loudspeaker, Koike called on supporters to "end the politics of Abe," lashing out at the long-serving premier over recent scandals that have weighed on his popularity. "The political status quo has continued while politics itself has lost the public's confidence," charged the former TV anchorwoman, 65. The 12-day campaign will be fought around reviving Japan's once world-beating economy and the ever-present threat of North Korea which has threatened to "sink" the country into the sea. Koike's "Party of Hope" has swallowed up and replaced most of the main opposition party in the space of a week, transforming Japan's staid political landscape. But surveys suggest her bandwagon is grinding to a halt as she refuses to run herself for PM in the election, focusing on running the world's most populous city with three years until Tokyo hosts the Olympic Games. A poll in the top-selling Yomiuri daily suggested that 32 percent of voters plan to vote for Abe's conservative LDP with 13 percent for the Party of Hope -- down six percentage points from the previous poll in late September. But Koike stole his limelight by launching her party, attacking Abe's government for being too slow to reform the country, weighed down by an ageing population, deflation and a huge debt mountain. Abe returned to power in December 2012 and has pushed a nationalist social agenda as well as his trademark "Abenomics" economic policy, promising to kick deflation and achieve two-percent inflation with stable growth in two years. But nearly five years later, he has failed to deliver on those pledges. Critics argue that Abe called the early election to divert attention from a string of scandals, including allegations of favouritism to a friend in a business deal -- which the premier strongly denies. And analysts say the October 22 is effectively a referendum on Abe, who has enjoyed unrivalled political strength for the past five years in part because of a lack of credible opposition, while his key policies remained controversial or unpopular. 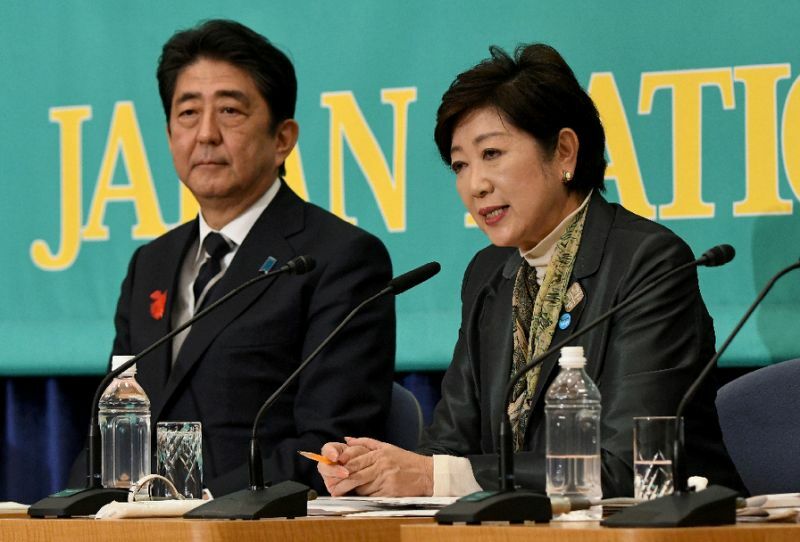 Koike says her new group promotes "compassionate conservatism" and hopes to distinguish herself from Abe by pledging a phase-out of nuclear power by 2030 and a freeze on a planned sales tax hike. Koike sceptics, however, charge that she repeats vague, catchy phrases and lacks details including how to pay for her ambitious projects. Abe plans to use proceeds from the proposed tax hike on making childcare free in a bid to get more women into the labour force. He has also appealed to voters to keep him in power so he can continue his hard-line approach to North Korea, which has fired two missiles over Japan's northern island of Hokkaido. More than 1,000 candidates were expected to run for 465 seats in the all-powerful lower house -- a reduction of 10 seats from the previous election. Abe's ruling bloc currently holds a two-thirds majority, with his long-ruling LDP holding 287 seats while its junior partner Komeito has 35. Tokyo's popular governor Yuriko Koike launched a bitter attack on Prime Minister Shinzo Abe Tuesday as the gloves came off for the official start of a snap election campaign in the world's third-largest economy.